Some secret CMD commands here. Check out the list of 18 CMD tricks and commands, that are amazing and simple to learn. 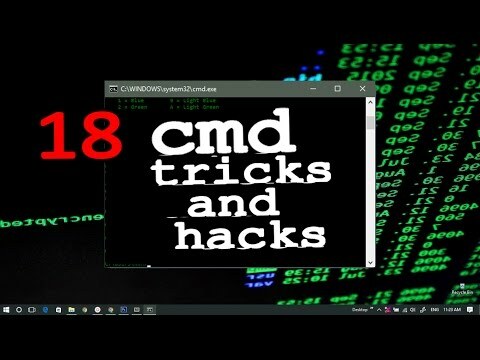 You will find cool cmd tricks to impress your friends. You can make a hidden folder which is not visible even when you enable 'Show Hidden Files'. You can make a folder which cannot be deleted of copied. Want to create a wifi hotspot or open a website using CMD or want to know the IP address of any website, you will find all these in this amazing video. So, if you liked watching this video, why don't you hit the like button, and share this with your friends! I'll be uploading more such videos soon, click on Subscribe to get notified for same. This is an informational video and, is meant for educational purpose only. BITSOFTUTORIALS and its channel manager won't be responsible for any misuse of commands shown in this video. Please use these commands wisely.